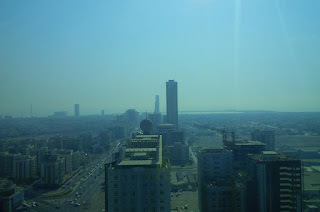 The Oilholic recently found himself roughly 127 km east of Dubai in the United Arab Emirate of Fujairah for a speaking engagement at the Gulf Intelligence Energy Markets Forum 2015. Among a plethora of crucial subjects up for discussion at a time of low oil prices, much thought in a new place one hadn’t been to before, went towards pondering over an old critical topic – crude oil shipping lanes in the Middle East. The region's geopolitical tensions have threatened to disrupt oil shipping and other maritime movements at various points over the last five years and counting, even though an actual maritime disruption thankfully hasn’t take place (so far). But whether it’s the Suez Canal, Bab al-Mandab Strait and the Strait of Hormuz, through which a fifth of the world’s oil passes, the threat of naval affray will ever go away. Back in 2013, barely 12 months on from an Iranian threat to block the Strait of Hormuz, the Oilholic examined nascent mitigation measures to bypass that threat from Oman. However, one got a sense, that Omani overtures also had much to do with challenging nearby Dubai's dominance as a commercial port on the 'wrong' side of the Strait of Hormuz and prone to the Iranian threats. To this effect, the Omanis are pumping billions into four of their ports – Muscat, Sohar, Salalah and lately Duqm – all of whom face the Gulf of Oman and won’t be affected in the highly unlikely event of the Strait becoming strife and blockade marred. Of the four, Duqm, an erstwhile fishing village rather than a port, stands to benefit from a new refinery, petrochemical plant and beachfront hotels. However, the UAE’s trump card appears to be its own hub in the shape of Fujairah; the only one of the seven emirates with a coastline facing the Gulf of Oman. 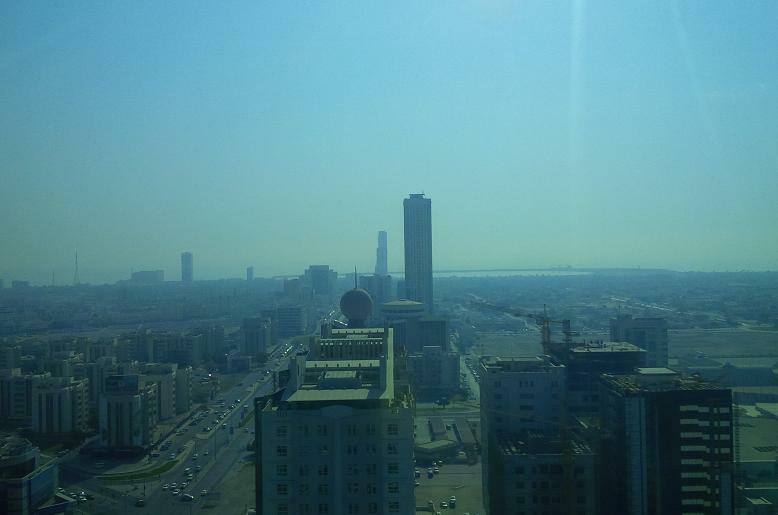 With oil-rich neighbour Abu Dhabi as its backer, few would bet against Fujairah. Indeed, the sleepy and quaint Emirate has woken up, as deliberated by EMF 2015 delegates, with new highways, hotels, supermarkets, ancillary infrastructure - the works! 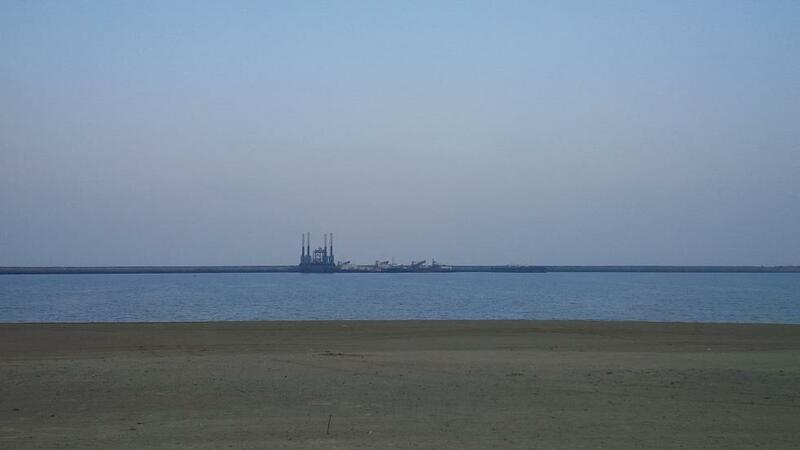 It isn’t just another maritime outlet for the oil industry; storage and petrochemicals facilities are directly linked with over two decades of efforts (and counting) in getting Fujairah to where it is today in infrastructural terms, according to one delegate. Abu Dhabi’s International Petroleum Investment Company (IPIC), the owner of CEPSA and minority stakeholder in Cosmo Oil and OMV and brains behind the $3.3 billion Habshan–Fujairah oil pipeline, is busy enhancing the now operational pipeline’s onstream capacity from 1.3 million barrels per day to 1.5 million bpd to eventually 2 million bpd. The idea is to pump more and more crude for dispatch avoiding passage of ADNOC cargo via the Persian Gulf. Oil storage volume is set to undergo an increment too. Gulf Petrochem, a key player in oil trading world is spending $60 million to boost its storage facilities at Fujairah. PIC’s Fujairah Refinery project, currently on cards, will process domestic crude oil, including Murban and Upper Zakum, with ready storage and dispatch facilities. And of course, those playing contango would wonder if Fujairah and rival Omani ports could (in the not to distant future) provide a Middle Eastern storage hub to rival onshore storage elsewhere. Discussions with key EMF 2015 delegates under Chatham House Rules point to a high degree of optimism on the subject of enhanced storage in Middle East whether or not contango plays pay-off. The Oilholic’s feelings are quite clear on contango plays - as one wrote in a Forbes column back in back in February, there will be gains, but those hoping for returns on par Gunvor’s handsome takings from 2008-09 are in for a disappointment. In the strictest sense, what the Omanis and Emiratis are attempting has little do with the current round of contango punts. Senior ADNOC, Gulf Petrochem, IPIC executives, policymakers and others told this blogger that what’s afoot in Fujairah is about future proofing and providing the region with a world class facility to process, store and ship domestic crude. Everything else would be secondary. In any case, by the time planned works and storage enhancements come onstream, the current contango play might well be over and done with! That's all from the UAE folks. Keep reading, keep it ‘crude’! © Gaurav Sharma 2015. 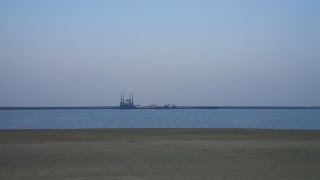 Photo 1: Gulf of Oman shoreline. Photo 2: Town Centre, Fujairah, UAE © Gaurav Sharma, September 2015. As another week starts with both Brent and WTI futures trading lower, concerns about China which aren’t new, continue to be brandished about. What the Oilholic does not understand is the overt obsession in certain quarters with the direction of Chinese equities. The country’s factory gate prices and purchasing managers’ indices haven’t exactly impressed over the last few months. Yet, somehow a stock market decline spooks most despite both the mechanism as well as the market itself lacking maturity. It is also constantly prone to government interference and crackdowns on trading firms. On one level the anxiety is understandable; the Shanghai Composite Index – lurking just around 3,080-level at the time of writing this blog post – has lost nearly 39.5% since its peak in mid-June. However, it does not tell the full story of China’s economy and the correction it is currently undergoing, let alone its ambiguous connect with the country’s oil imports. The sign of any mature stock market – for example London or Frankfurt – is that the total tradable value of equities listed is 100% (or above) of the country’s Gross Domestic Product. In Shanghai’s case, the figure is more in the region of 34%, suggesting it still has some way to go. A mere 2.1% of Chinese equities are under foreign ownership at the moment. Many of the country’s major companies, including oil and gas firms, have dual listings in Hong Kong or New York, which while not an indication of lack of domestic faith, is more of an acknowledgement of impact making secondary listings away from home. Mark Williams, Chief Asia Economist at Capital Economics, feels panic over China is overblown. “The debacle in China’s equity market tells us little directly about what is going on in China’s economy. The surge in prices that started a year ago was speculative, rather than driven by any improvement in fundamentals. A combination of poor data and policy inaction in China may have triggered recent market falls but the bigger picture is that we are witnessing the inevitable implosion of an equity market bubble,” he said. Furthermore, current turmoil does not provide any direction whatsoever on what the needs of the economy would be in terms of oil imports. Apart from a blip in May, China has continued to import oil at the rate of 7 million barrels per day for much of this year. That’s not to say, all of it is for domestic consumption. Some of it also goes towards strategic storage, data on which is rarely published and a substantial chunk goes towards the country’s export focussed refineries. China remains a major regional exporter of refined products. Admittedly, much of the commodities market should be worried if not panicking. Over the years, China consumed approximately half of the world’s iron ore, 48% of aluminium, 46% of zinc and 45% of copper. Such levels of consumption could never have been sustained forever and appear to be unravelling. While China’s declining demand is of concern, chronic oversupply in the case of a whole host of commodities – including oil – cannot be ignored either. The current commodities market downturn in general, and the oil price decline in particular, remains a story of oversupply not necessarily a lack of demand. Another more important worry, as the Oilholic noted via a column on Forbes, is the possibility of a US interest rate hike. The Federal Reserve will raise interest rates; it might not be soon (i.e. this month) but a move is on the horizon. This will not only weigh on commodities priced in dollars, but has other implications for emerging markets with dollar denominated debt at state, individual and institutional levels; something they haven’t factored into their thinking for a while. In summation, there is a lot to worry about for oil markets, rather than fret about where the Shanghai Composite is or isn’t going. That’s all for the moment folks! Keep reading, keep it ‘crude’! © Gaurav Sharma 2015. 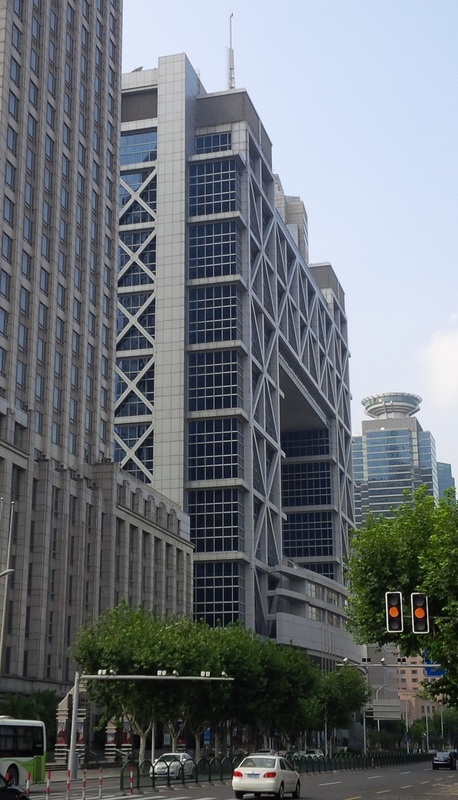 Photo: Shanghai Stock Exchange, Shanghai, China © Gaurav Sharma, August 2014. The oil market is not making a whole lot of sense at present to a whole lot of people; the Oilholic is admittedly one of them. However, wherever you apportion the blame for the current market volatility, do not take the convenient route of laying it all at China’s doorstep. That would be oversimplification! It is safe to say this blogger hasn’t seen anything quite as barmy over the last decade, not even during the post Lehman Brothers kerfuffle as a US financial crisis morphed into a global one. That was in the main a crisis of demand, what’s afoot is one triggered first and foremost by oversupply. This was followed on Monday, August 31 by some hefty gains of over 8% for both Brent and WTI. Yet at the time of writing this blog post some 48 hours later, Brent had shed over 10% and the WTI over 7% on Tuesday but again gained 1.72% and 1.39% respectively on Wednesday. The reasons for driving prices down were about as fickle as they were for driving them up and subsequently pulling them down again, and so it goes. When the US Energy Information Administration (EIA) reported on Monday that the country’s oil production peaked at just above 9.6 million barrels per day (bpd) in April, before falling by more than 300,000 bpd over the following two months; those in favour of short-calling saw a window to really go for it. They also drew in some vague OPEC comment (about wanting to support the price in tandem with other producers), knowing full well that the phoney rally would correct. The very next day, as the official purchasing managers’ index for Chinese manufacturing activity fell to 49.7 in August, from the previous month’s reading of 50, some serious profit-taking began. As a figure below 50 signals a contraction, while a level above that indicates expansion, traders found the perfect pretext to drive the price lower. Calling the price higher based on back-dated US data on lower production in a heavily oversupplied market is about as valid as driving the price lower based on China’s manufacturing PMI data indicative of a minor contraction in activity. The Oilholic reckons it wasn’t about either but nervous markets and naked opportunism; bywords of an oversupplied market. So at the risk of sounding like a broken record, this blogger again points out – oversupply to the tune of 1.1-1.3 million bpd has not altered. China’s import level has largely averaged 7 million bpd for much of the year so far, except May. 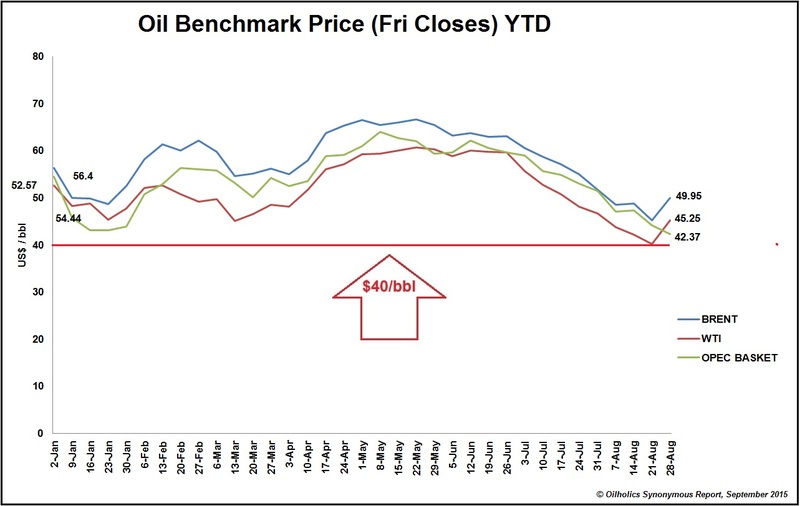 Yours truly is still sticking to the line of an end of year Brent price of $60 per barrel with a gradual supply correction on the cards over the remaining months of 2015 with an upside risk. Chances of Iran imminently flooding the market are about as likely as US shale oil witnessing a dramatic decline to an extent some in OPEC continue to dream off. But to get an outside perspective, analysts at HSBC also agree it may take some time for the market to rebalance fully. “The current price levels look completely unsustainable to us and a combination of OPEC economics and marginal costs of production point to longer-term prices being significantly higher,” they wrote in a note to clients. The bank is now assuming a Brent average of $55.4 per barrel in 2015, rising to $60 in 2016 and $70-80 for 2017/18. Barclays and Deutsche Bank analysts also have broadly similar forecasts, as does Moody’s for its ratings purposes. The ratings agency sees a target price of $75 achieved by the turn of the decade, but for yours truly that moment is bound to arrive sooner. In the meantime, make daily calls based on the newsflow in this barmy market. That’s all for the moment folks! Keep reading, keep it crude! © Gaurav Sharma 2015. 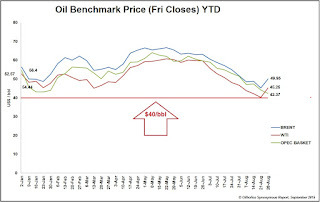 Graph: Oil benchmark Friday closes, Jan 2 to Aug 28, 2015 © Gaurav Sharma, August 2015.